Pam and I spend a good portion of our full time RV living in warmer climates. We have wondered if a portable ac unit would help really cool the rig down when it’s in the nineties, and with high humidity? So we started looking at portable air conditioner reviews to see if we could find one that would work for us. Our fifth wheel has two AC units: one is a 15k Btu unit, and the other is a 13.5K unit. They are in a ducted system, which makes the system quieter, but you do loose some cooling in the transfer. They mostly do a great job, but when you are in south Florida in the summer, they run an awful lot. Keeping it in the low 70’s means running them constantly. Doing that risks freezing up the cooling coils thereby possibly damaging the unit. So in order to get them to cycle, thermostat settings stay in the upper seventies during the day time. So, after researching this option for the past year, this is what we have come up with, thanks to consumer reports. If you have been thinking like we have, perhaps the information we share here will help you as you consider this option too. It may save you some time as you are looking at portable air conditioner reviews. Think of portable air conditioners as the cooling choice of last resort. They’re better than a fan but not much. That’s what Consumer Reports discovered in its tests of eight portable air conditioners that, despite their claims, barely got a room below sweltering let alone the 78 degrees. That’s considered the upper threshold of indoor comfort. 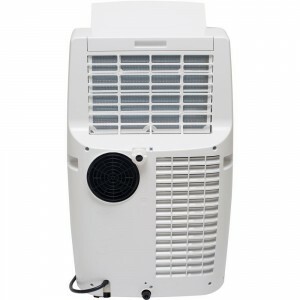 Portable air conditioners are intended for homes in which window configurations or building regulations prevent installation of window units. They can also be a consideration for small rooms like in an RV. But getting one is a compromise you may not want to make because they’re typically bigger, noisier, more expensive, and use more energy. In fact, retailers report that many portable air conditioners are returned each season by dissatisfied customers. Unlike a window air conditioner, all the mechanical parts of a portable air conditioner are sitting in the room you’re trying to cool. 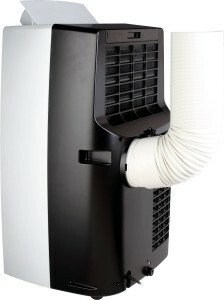 This contributes to the noise and less-than-capable cooling, as the portable unit is using conditioned air from the room to cool the condenser and exhausts the hot air out an ungainly exhaust hose that resembles a dryer vent. That creates negative pressure causing unconditioned warm air from surrounding rooms or outdoors to be drawn into the room you’re trying keep cool. Now they do have dual hose units that help with this situation, but they tend to be a few hundred dollars more than the single hose units. If you are going to spend $500 – $800 for one of these, why not just get a better roof unit! And it’s debatable how portable they are, since once the hose is connected to the kit in the window, you won’t want to move the unit, especially since they typically weigh 50 to 80 pounds. While they do have wheels, portable air conditioners can be difficult to roll on carpets and over raised thresholds between rooms. They also need their space—the hose is 5 to 7 feet long and the air conditioner must be positioned away from any walls or furniture that may block its airflow. This makes it a terrible choice for an RV! In Consumer Reports tests, they measured how long it takes a portable air conditioner to lower the temperature in a room appropriate for its claimed size from 90 degrees to 75. But few made it to even 80 after 100 minutes. 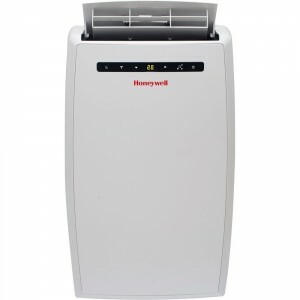 None made our list of recommended air conditioners but if you have no alternative, consider the Honeywell MN10CES[WW] at $399, for its lower price. While only fair at cooling, it was a champ in their tests simulating brownout conditions, as were four other models. While they test portable air conditioners the same way they test window units, most manufacturers don’t. The Department of Energy is reviewing the current industry test for portable air conditioner capacity and efficiency. The current test doesn’t account for what is often significant leakage and transfer of hot air into the space being cooled. One alternative being investigated by the DOE is that the industry adopt the window air conditioner test for portables as well because it more accurately measures actual cooling. This would make it easier for consumers to compare portable and window air conditioners. In the meantime don’t assume that a portable air conditioner rated at 5,000 to 15,000 Btu’s will cool like similarly rated window models. If you really have no other option to upgrading your roof units, this can be a way to get by during the really hots months that you have to endure. The better option is to live in a cooler climate. After all, if you live in an RV, you can move your home wherever you want. For us, we are located where we are for specific reasons and we kind of have to stay put. But, come winter we’ll be much happier!! We hope this helps you as you consider keeping cool in your RV. Please leave a comment if you found this review helpful. Let us know what you decided to do. Thanks Caitlyn! Living in Mesa, Arizona in the summer, you really know what heat is!! We spent a winter there and left in mid-April. It was already hot then, and dry too! Enjoy your winter and thanks for checking in! Be sure the roof structure can handle the weight of a 100 lb unit as well as the vibration it creates upon startup. I have a Diamond Cargo trailer and toyed with the same idea but they said the roof, as constructed, would not accommodate a rood AC unit. Hopefully, yours can. Could you use a winder a/c and your roof air at the same Time? We are in Arizona and our 15000 btu foor air is not keeping up. Thanks for stopping by our website Jim! I see other RVers using small window AC units. As long as you are not exceeding the electrical capacity of your RV while running both. For 30 amp RV’s you only have 3,600 watts available. A 15k unit and a small window AC unit would most likely, depending on the size, get pretty close to 3,600 watts with both running, perhaps even exceed that. Now a 50 amp RV would not have a problem as long as you are not exceeding the electrical capacities of any one branch circuit. Good read. Having an interesting your posts. Thanks, a lot of sharing! kudos!